The insect family includes the weird, wonderful, amazing, and totally unexpected.This book is the step-by-step way to learn how to draw a fantastic collection of these strange creature, so making them easy to draw. 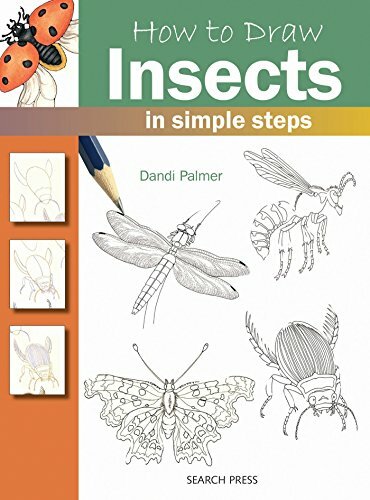 The insect family includes the weird, wonderful, amazing, and totally unexpected.This book is the step-by-step way to learn how to draw a fantastic collection of these strange creature, so making them easy to draw. Author Dandi Palmer shows how you just take simple shapes and build them up in clear stages little by little. This visual and practical approach will have you reaching for your drawing tools time and time again. Here you will find all kinds of wonderful insects, from the more harmless, friendly ladybirds and beautiful butterflies, to predators such as the spiny flower mantis and the wasp. Also included are a dragonfly, a female glow worm, the puss moth caterpillar, and many more. The two-colour line illustrations make the drawing process simple, highlighting every stage, and the final images show what to use if you choose to produce a final, full colour image. You do not have to know how to draw to use this book. Instead, the projects will build up your skills and give you the confidence to create your own drawings. Experienced artists will find this book useful too. It is a great source of ideas and an inspiration for anyone wanting to draw these fascinating creatures.